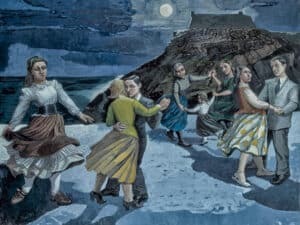 Lynda Woodroffe offers a psychotherapist’s view of the work of Portuguese artist Paula Rego, and discovers how her art has been shaped by her childhood wounds, th e challenges of motherhood, and the social and political struggles faced by women in Portugal. 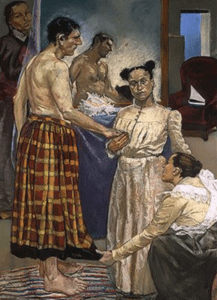 The cover of the book, The Mother in Psychoanalysis and Beyond (2016) is the Portuguese artist Paula Rego’s work, ‘Self Portrait in Red’ (1962). (You can read a review of the book in the Winter 2017 issue of Contemporary Psychotherapy). It is a self-portrait of what appears to be a lost child. The painting shows a chaotic world and a child alone, lost in the chaos. In the early years of Rego’s life, Portugal was beset by political difficulties. Between 1932 and 1974, Portugal was ruled by the fascist Antonio de Oliveira Salazar. It was also an extremely Catholic culture, aspects of which deeply affected women. This article illustrates, with pictures and text, the many ways that Rego mirrored Portuguese life and politics in twentieth century Portugal. Her work shows how the political is also the personal, and how suffering was caused by the politics and religion of the time. 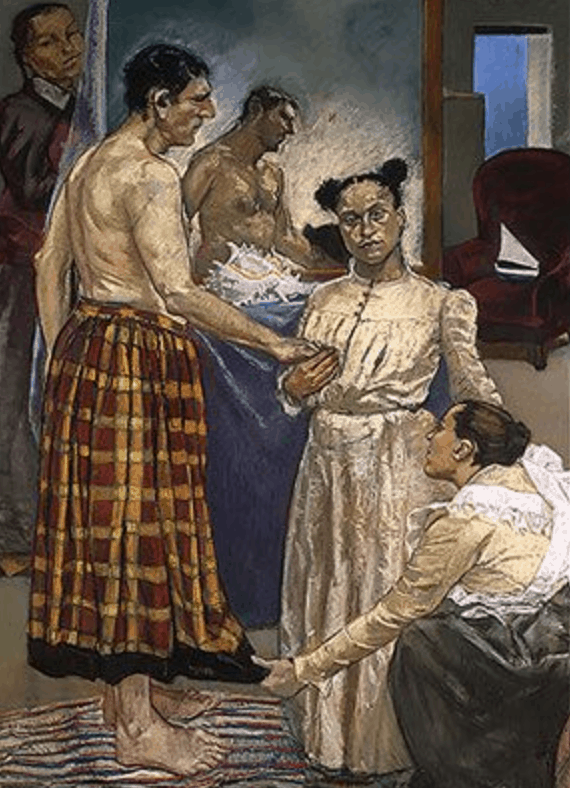 Paula Rego was born in 1934 to a comfortable middle-class family. When she was two years old, her parents went away to work in the UK, leaving Rego in Lisbon with her grandmother. They were away for 18 months. In an interview she describes how when they returned, she didn’t recognise them, didn’t know who they were and said “I didn’t know what a mother was.” Rego was left with feelings of great loss that she never properly came to terms with. She states that she developed a “fear” as a result of this (Bragg, 2013). Bowlby (1988) might describe this as separation anxiety, which can cause fear and anger, both apparent in Rego’s art. Her grandmother was an important person in Rego’s life. In one of her pastel drawings, Rego shows a grandmother breastfeeding not a baby, but a child who is lying across her lap. Rego is perhaps showing the love that a grandmother can give by offering her own body to nurture a child. There are three other female characters in this picture, all different ages. While the grandmother is suckling one of them, the others seem to look on, anxiously soothing themselves with their thumb or fingers. Perhaps they represent Rego at different stages in her life? Winnicott might have reflected on this as a transitional phenomenon: a child getting help from an external object to move from one state to another, usually indicating a process of separation (Gomez, 1998). Rego remained with her grandmother in Lisbon until she was sixteen years old, visited intermittently by her parents. In 1950, Rego discussed her future with her parents: she had chosen to be an artist like her mother. At first, she travelled to London and attended a finishing school. Her guardians there recommended the Slade School of Fine Art for her further education. This college was chosen with the confidence that it was a decent art school, and a place where she would be protected from the attentions of men and could avoid getting pregnant (Girls never get pregnant at the Slade School of Fine Art, 2011). At the same time, another student, Victor Willing, also attended the Slade. He and Rego were attracted to each other and formed a life-long attachment. Willing was six years her senior and already married. 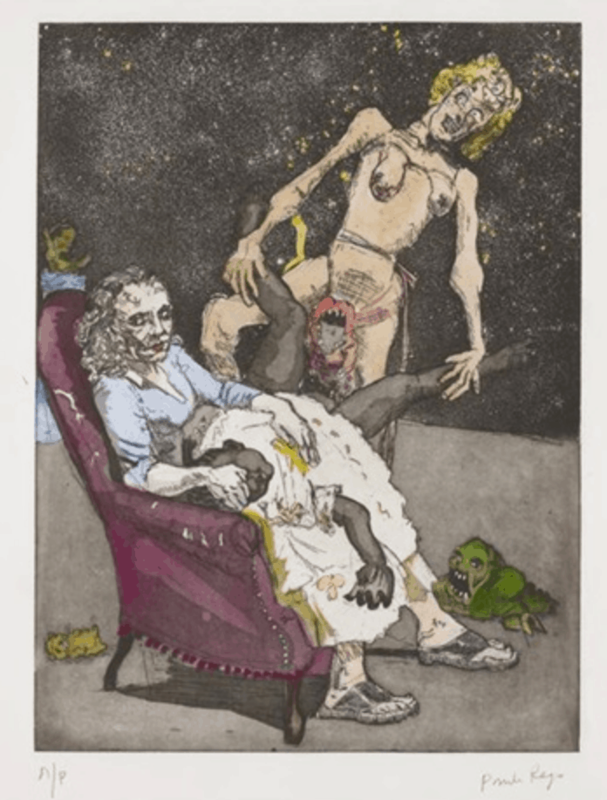 As a child who had felt abandoned so young, Rego may have been searching for a connection with an older, married man, the personification of the father. This can be seen as representing an unconscious desire for reunification with her own father, a gestalt for all those years without him. The attraction may in part have been the archetype of the father: power and authority. Moreover, three years after they met, Rego became pregnant. By becoming a mother herself, Rego got the chance to recover the mother she felt she had lost. Baby Caroline was born and she and Willing moved to Lisbon, supported by her parents. It wasn’t long before Rego suffered from depression. She said: “I seized up and got into a terrible depression. I couldn’t keep following the rules; I had to break out” (Jaggi, 2004). She sought help from Jungian analysis. In an interview with the journalist Melvyn Bragg (‘Paula Rego on Fear’, 2013), she stated that the therapy room was one of the only places where she felt safe. She made a lot of discoveries and believed the relationship with her parents was fractured. She expressed a great fear of being separated from them. Her first horror – abandonment – which she describes in the interview as “fear”, was characterised by her constant crying for her parents who seldom visited her. In the interview, Bragg suggests a connection between her art and this fear, and Rego admits that fear motivates her art and “gives it a face”. She remembers searching for her mother, crying at her first and every other subsequent departure, crying for her when she was not there. Having unpredictable and unreliable parents is likely to have led Rego to develop insecure attachment patterns, which would have affected her ability to form healthy relationships (Wallin, 2007). Rego’s nursery rhymes series can be seen as depictions of her terror of separation: perhaps the rhymes themselves are transitional objects? It is likely that Rego was influenced by her Jungian therapy to use the props in her studio as archetypes in her work. These props included monkeys, spiders, dogs, rams, and dolls. Jung described archetypes as symbols or templates that are recognised in the collective unconscious: a spider is something to be feared, a ram is a symbol of fertility, a monkey is full of mischief and sexuality, and so on (Stevens, 1994). 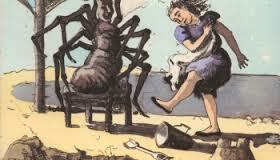 In these drawings, Rego depicts what could be Jungian archetypes for terror: a huge, attacking, engulfi ng spider, and a large ram, the symbol of dominance and masculinity. The child in these drawings is always alone, unprotected. One wonders if this was how Rego felt, left by her parents at such a young age. 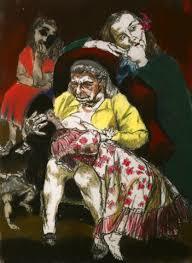 Having, or even being, a loving mother seems to be an enigma for Paula Rego. This is exemplified in a set of ambiguous images of a mother with a child in confusing and violent circumstances. The pictures raise the question, what was going through these mothers’ minds? 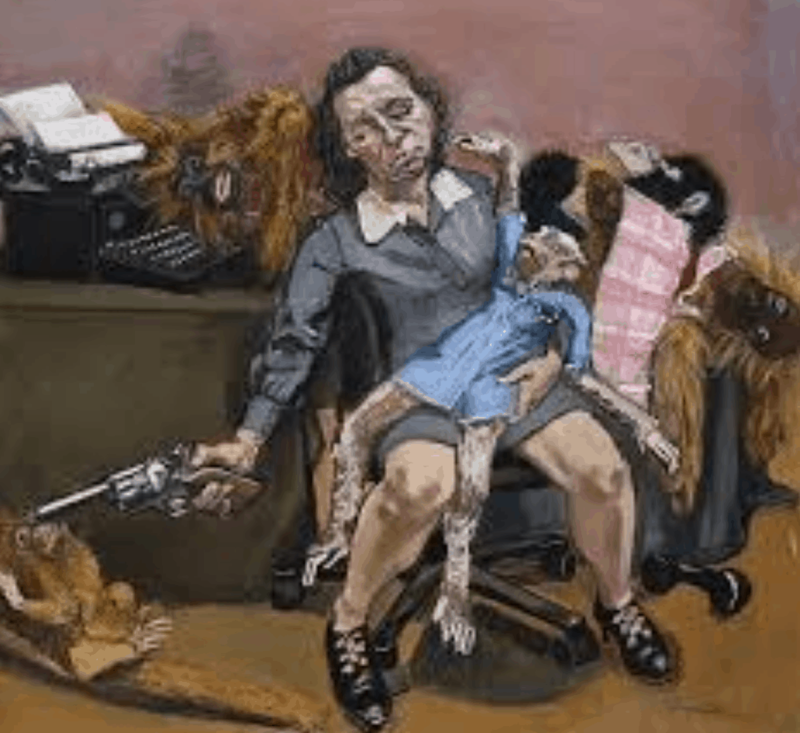 Here is a woman with a gun, holding a monkey across her lap, another on the floor and two more monkeys. Monkeys can be seen as representing mischief and sexuality. Moreover, genetically, they are closely related to humans. Rego is likely to have borne this in mind. These animals are her props. “The props serve as the models and the inspiration for her drawings and paintings, but more than that you sense they are metaphors and emblems for the world of Rego’s imagination, phantoms of memory, myth and nightmare”, (Brown, 2009). She used them to tell stories. Rego entitled one of her works, ‘Mother Loves You’. But one wonders, did she? Did Rego’s mother love her daughter, only to go and leave her, aged two, in the care of her grandmother? How can she ever be sure that her mother did love her? The drawing does not appear to depict love. And when her mother visited her, how focused was she on her child? This question must have formed often in Rego’s mind: was she a bad child who deserved to be punished by being abandoned? In such circumstances, Jung suggests that the child may create ego-defence mechanisms to cope with the pain of abandonment, denying any badness in herself and projecting it onto others. Later, as a mother herself, Rego became the “bad person”, leaving her children while she worked uninterrupted in her studio. ‘The Shakespeare Room’ shows a mother who is either going to drop her baby or is torturing her, perhaps preoccupied with her own thoughts. One wonders if Rego is showing her own mother or herself, someone who is not focused on her child, but caught up in her own thoughts and, perhaps, her depression? 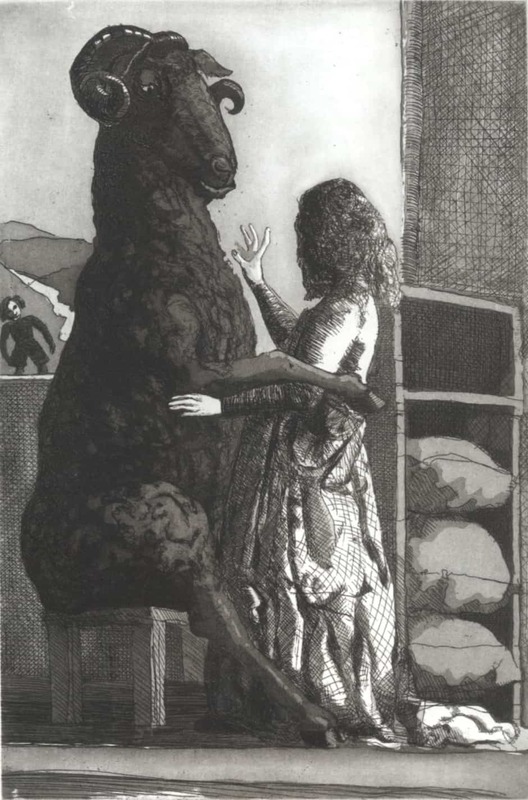 The shadow of the mother is depicted here. The archetypal mother, a symbol of love and nurture, seems absent and instead, her shadow comes to the fore. Helpless, the child is an archetype of innocence. Stevens (1990) writes, “in the absence of the personal mother, the archetype can be activated by any other female who is consistently in loco parentis – an aunt, grandmother, nanny or older sister”. But Rego also made several pieces showing a mother’s warmth and love, a mother who is holding a pig. For Rego, the pig is a love-object and a symbol of sweetness and neediness. Despite their reputation for being dirty, greedy and fat, nursery rhymes frequently portray pigs as sweet (Ten Little Pigs), prey to the wolf (Three Little Pigs) and human-like (This Little Piggy Went to Market). So what did the pig mean to the artist? Maybe it was her baby? Maybe it was the artist herself? Using her art, Rego created fantasies that dealt with her needs and fears, providing her with some solace and contentment following her early years of unhappiness. When her mother died and her father remarried, the stepmother began to feature in some of Rego’s art works. She had a tormented relationship with her stepmother and portrays her as an outsider, excluded and evil. The Portuguese word for stepmother is madrasta, which also meant ‘heartless mother’, or ‘evil woman’. Perhaps in despising her stepmother, Rego is also colluding with that misogyny? In ‘Snow White Playing with her Father’s Trophies’, (1995) Snow White is pictured in a white dress, symbolising virginity and innocence, and she looks out at her audience, aware of the power of her youthful sexuality. Between her legs, she holds the head of a stag. This exemplifies sexual awakening and insinuates improper affection towards her father. In the background, her stepmother kneels, looking on with scorn and envy. And similarly, in ‘Snow White Swallows the Poisoned Apple’ (1995), Rego portrays an inverted young woman after she has taken a bite out of the poisoned apple, an apple dispensed to her by the archetype of the evil queen/jealous stepmother/wicked witch. Much of Rego’s art is sexual, violent and disturbing, but scrolling through a list of her artworks reveals that women are prominent. She highlights the difficulties that women experience without portraying them as victims: they are strong, angry, and can defend themselves. In a series of paintings called ‘Dancing Ostriches’ (1995), her ballet dancers are tall, well-muscled, inelegant women in black tutus. She shows a different attitude towards women dancers, challenging us to abandon the stereotype of ballerinas. Nearly all of Rego’s portraits were modelled by her maid, Lila Nunes, including these women. Ostriches are flightless and clumsy, although they excel at sprinting. It is thought that these images were inspired by the Disney film ‘Fantasia’. Through the paintings, Rego reflected that she was ageing: “They’re quite vulnerable but they kick – like the birds,” she says of her women (Jaggi, 2004). “They’re trying to make themselves attractive and dance on points, but they’re past it. It’s grotesque but I’m not making fun of them. How could I? They’re just like me” (Jaggi, 2004). 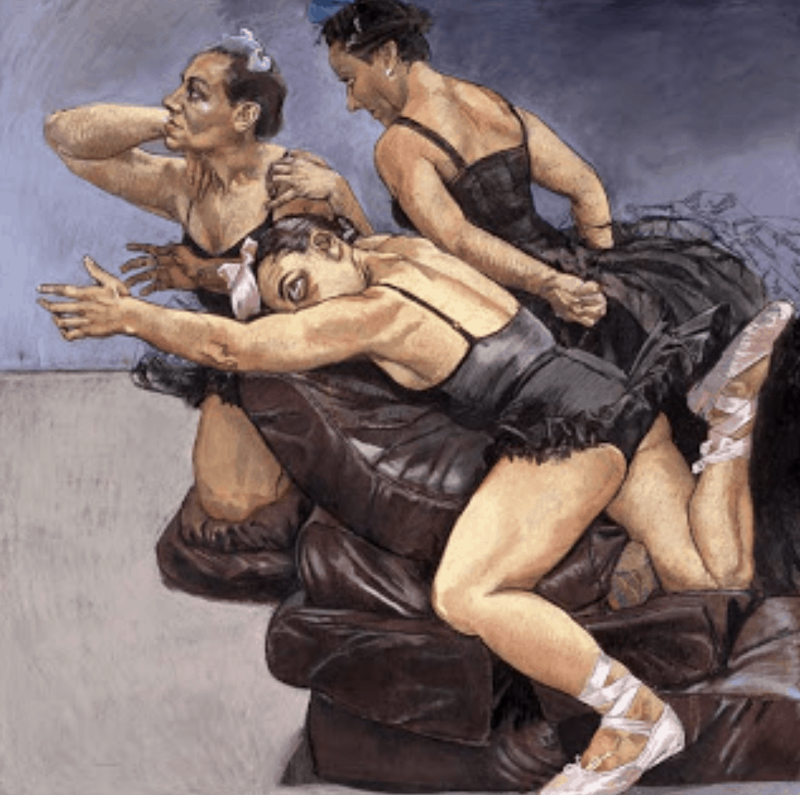 Paula Rego was nothing if not controversial. She pushed the boundaries and offered her audience images that shock and disturb. In a series of pastel drawings on paper, Rego characterized young women in the throes of abortion. Ten years after the Portuguese Revolution, and before 1984, abortions were illegal and, therefore, potentially lethal. Conversely, in the UK, legal and safe abortions had been available since 1967. Difficult though it was, Rego bravely raised this issue as a protest against the abuse of women in Portugal during Salazar’s oppressive regime, which heavily promoted Catholicism. In 1984, six years after Salazar died and ten years after the revolution, abortions were made legal for pregnancies of up to twelve weeks. Rego’s dog women series show women in positions adopted by dogs, sometimes bent over, nearly always on all four feet, sometime s sleeping on their sides or their backs. Rego thought dogs were strong and loyal and, like women, could also be fierce, frightening and not easy to deal with. They are not downtrodden but powerful. The dog women series shows women who can rule and will not be ruled. Rego wanted to use her works to insult abusers, raise questions about abuse and oppression and to show strength where weakness may prevail. She felt that dogs could be tender and caring, as well as protective and aggressive. Rego was disdainful about Catholicism and produced a set of paintings about the abuse of women by men of the cloth. ‘Father Amaro’ (1998) is a pastel work inspired by a Mexican-Spanish film that was loosely based on the 1875 novel, The Crime of Father Amaro by the Portuguese writer Jose Maria de Eca de Queiroz. It is an anti-clerical story about a priest who takes advantage of a young girl, an archetype of innocence and purity, who then becomes pregnant. When she gives birth, he takes the baby and gives it to a woman who is called the “maker of angels”. The woman kills unwanted babies. Rego’s portrait shows Father Amaro as an infanticist. In this painting, the infanticist is a man, and moreover, a man of god, unlike the abortionists who were women. The drawings show Rego’s anger at the treatment of young women, the abuse and treachery by someone supposedly representing what is moral and good, towards someone innocent and trusting. This is one of Rego’s most well known paintings. She started the sketches for it when her husband was dying. The intensity of his sickness and his subsequent loss hit her hard. She continued to work despite his death, using her art to help her survive. It is as if the work itself was axiomatic to grieving, a transitional stage. The first sketches showed women only. In the final painting, she had added a man. It is the same man twice. First, he’s with his pregnant wife, then he has an affair with a blonde woman. The other women represent the stages in life of a woman alone: a little girl, a pregnant woman in love, a mother betrayed, a grandmother. Their faces show maternal love, joy, loneliness, disloyalty and suspicion. Another well-known painting, ‘The Fitting’, shows a debutante being prepared for her entrance into society. This could have been Rego’s debut. The mother is showing off her daughter, making her look in the mirror. 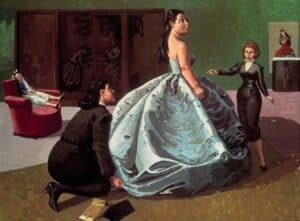 The dressmaker is kneeling, adjusting the hem, and her daughter, in contrast, is sitting like a doll in the background. The mother is tiny and pushy, the dressmaker large and helpful and the child is overlooked, neglected. These characters appear well known to Rego and could be parts of herself or family members. Other women and families are common in Rego’s work: her focus is women, always women. When she does depict men, she shows them from a woman’s point of view, her view. Rego is now 83 years old and lives in Hampstead, North London, where she has lived most of her life. She is still working and has been very prolific, exhibiting in major art galleries in many countries. 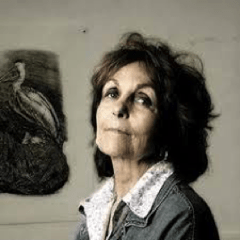 She has produced hundreds of paintings, drawings, prints and pastel works over a period of nearly sixty years. This article has been a cameo view of her work. What stands out for me are the changes that have taken place over those sixty years. Rego’s early sketches seem to depict chaos, but a chaos that she was able to harness to express her emotions. Rego’s art shows such a variety of feelings and conditions – grief, abandonment, anger, hatred, jealousy, helplessness, strength of character, misogyny and revenge, to name a few – all from the point of view of women being hurt by a cruel society. Bradley, F. (2002). 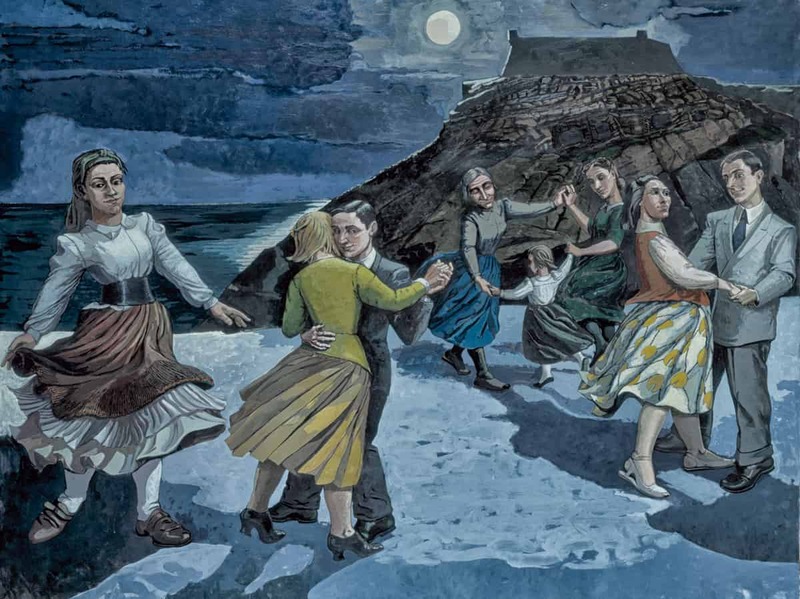 P R Paula Rego. London: Tate Publishing. Gomez, L. (1998). An Introduction to Object Relations. London: Free Association Books. McEwen, J. (2008). 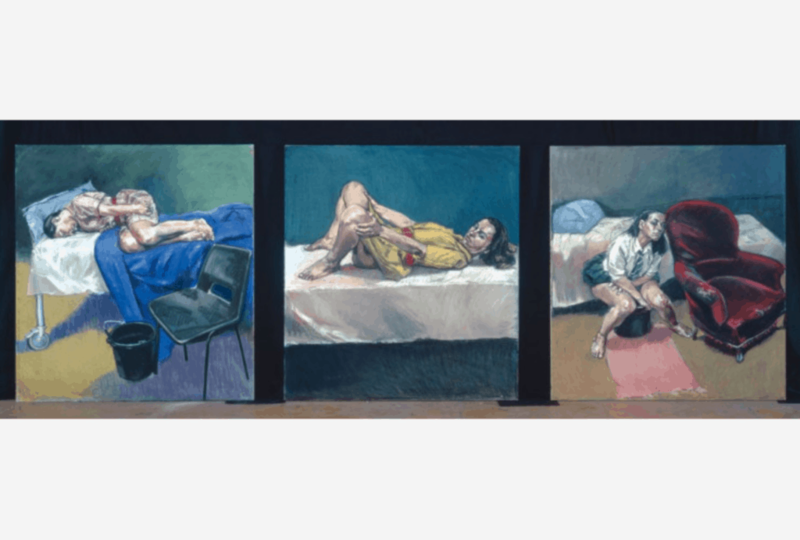 Paula Rego Behind the Scenes. New York: Phaidon. Stevens, A. (1990). On Jung. London: Routledge. Stevens, A. (1994). Jung: A Very Short Introduction. Oxford: Oxford University Press. Wallin, D. (2007). Attachment in Psychotherapy. New York and London: The Guilford Press. Eastham, B. and Graham, H. (2011). 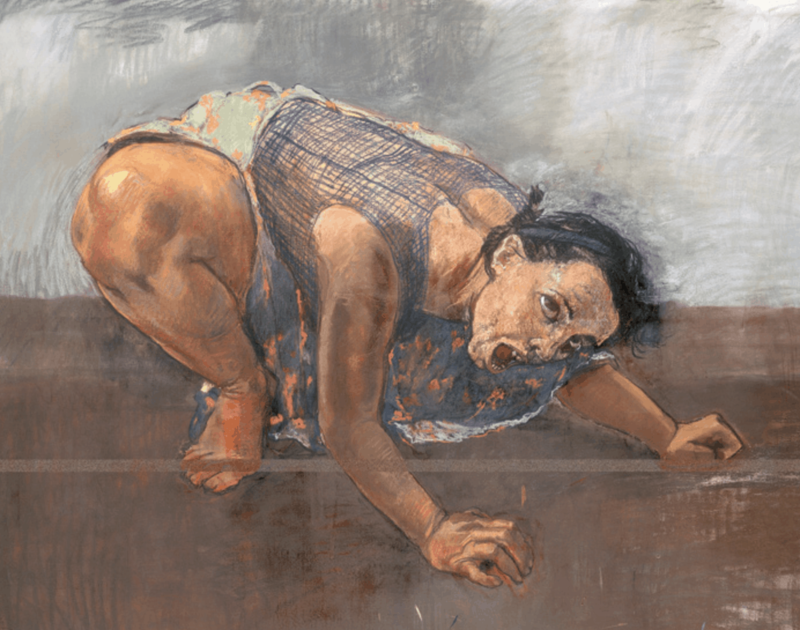 ‘Interview with Paula Rego’, The White Review [online]. Available at: http://www.thewhitereview.org/interviews/interview-with-paula-rego/ (Accessed: April 2016). ‘Robert Hughes Interviews Paula Rego’ (2004), video. Excerpt from ‘The New Shock of the New’, Oxford Film and Television. Available at: https://www.youtube.com/watch?v=q5iBro300kA (Accessed: April 2016). ‘Girls never get pregnant at the Slade School of Fine Art’ (2011), video, ‘Web of Stories: Life Stories of Remarkable People’. Available at: https://www.youtube.com/watch?v=czLxUoanKOA (Accessed: April 2016). ‘The Symbolism of the Animals in my Paintings’ (Date unknown), video, ‘Web of Stories: Life Stories of Remarkable People’. Available at: https://www.webofstories.com/play/paula.rego/22 (Accessed: October 2017).